2019 Winter Training Series has concluded. Thank you for your support! We Love Visitors! Stop in and worship God with us on Sunday morning, evening and Wednesday night! 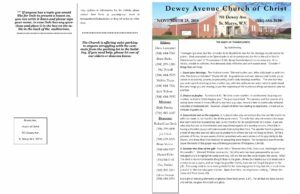 Copyright © 2019 Dewey Avenue church of Christ.